There are not many occasions for which I willingly rearrange furniture, wipe cat hair off the kitchen table, sweep the floor, and labor over the stove before an anticipated knock on my door. It simply hurts too much. The pain and fatigue from ankylosing spondylitis are too great for me to cook and clean on a regular basis, but hosting a potluck every few months is worth it for the friends I get to see. After college, several years before my diagnosis, I began hosting potlucks. I loved gathering friends in my home and sharing a meal together. These meals were an easy way to socialize without spending a lot of money or making all the food. After I was diagnosed, I gradually lost many social opportunities I had taken for granted when I was an athlete and worked full-time. It was a few years before I realized my potlucks had become my social life. Now I host potlucks several times a year and special meals on Thanksgiving and Christmas Day for friends who do not have plans elsewhere. While these occasions are draining, I prefer them over the stress and exhaustion of scheduling dinner out with a different friend every week. Hosting in my own home means I set the date, control the environment, choose the guests, and decide when people should arrive and leave. I have also discovered that if I am not able to provide a dish for my own potluck every time it is OK; there is always more than enough to go around. I often find myself eating leftovers for a week! For me it takes a couple months to conserve enough energy to host each potluck, but it is worth it every time. I can usually summon the energy to put on a party hat when my guests arrive because I know that as soon as they leave, my cats will come out of hiding and I can hibernate with them for at least a week to recover. Fortunately, I have been hosting potlucks for long enough that my guests also understand and accept that my energy levels will fluctuate. Choose a theme for each potluck, like “winter flavors” or “breakfast for dinner.” People love being challenged to think of new dishes. Encourage homemade food. Invite people you know well to your first potluck and celebrate whoever shows up, whether it is two people or 10 people. Schedule the potluck on one of your better days and block out enough time before and after to prepare and to recover. Create potluck guidelines ahead of time with the date, time, dietary needs or allergies, noise preferences, whether people should come if they are sick, whether alcohol is welcome, where to park, whether children are welcome, and whether you’re willing to talk about your disease all evening. When people arrive, hand them an index card to list every ingredient in their dish so guests with various dietary needs can eat without fear. Yes, every ingredient! Ask a friend to arrive early to help you set up, another friend to stay late to help clean up, and another friend to come over the next day to help put away clean dishes. Add a fun touch. Have guests vote for their favorite dish or have an anonymous gift exchange. Set up a self-serve station for everything or eat family-style around a table so that once people arrive you can sit and relax. Pro-tip: If radishes or Brussels sprouts are in season, toss a few of them into this recipe for a treat! Cut onion, potatoes, carrots, and sausage into bite-sized chunks. Dice garlic. 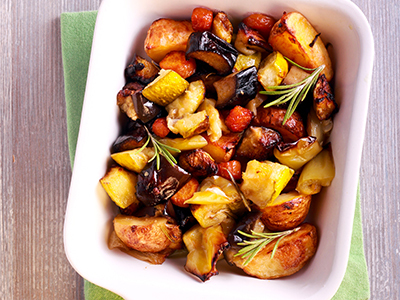 Place into a large bowl and mix with the balsamic vinegar, olive oil, apple cider vinegar, herbs and spices. Pour the contents into a large roasting pan and spread in a single layer. Use an additional roasting pan if necessary. Roast for 40 minutes, removing halfway through to toss the vegetables and sausage. Charis is a patient expert, writer, speaker, and spondylitis advocate in Sacramento, California. Her story has been featured in dozens of publications, including Arthritis Today Magazine, Mother Jones, CNBC, and her blog, BeingCharis. Charis’ life goal is to make ankylosing spondylitis a household name.